Large rivers affect military operations in two ways. Navigable rivers form important lines of communication both in war and peace. The importance of a river in this role depends on the minimum depth of its channel, which determines the maximum draft of vessels navigating the river; on its current, which if swift is less favorable to traffic upstream; and to its tendency to flood or change its channel, which increases the risks of navigating the river at certain seasons of the year. If the watershed drained by the river has strong seasonal precipitation patterns, the river may be useful for navigation only during certain seasons of the year. Unfordable rivers also pose significant military obstacles. Demolition of bridges over large rivers can seriously delay an attacker and allow a retreating force to withdraw safely. The attacker must then get across the river by boat, a slow and hazardous process, particularly under fire. In some respects a river crossing resembles an amphibious assault, but with the considerable advantage to the attacker than he can provide artillery support and other covering fire from the river bank he controls. On the other hand, except on the largest rivers, the attacker cannot bring in naval gunfire support. There were few large rivers on the islands of the Pacific, but the rivers of Burma and China played an important role in the campaigns in those areas. Slim ordered construction of a fleet of wooden river craft, eventually numbering 541 boats, to provide logistical support for his 1944 Burma campaign. The Pasig River, which passes through Manila, proved a significant obstacle to Allied troops attempting to storm the Japanese positions in the Intramuros during the battle for Manila in 1945. The Allies made significant use of bridging equipment, particularly in Burma. 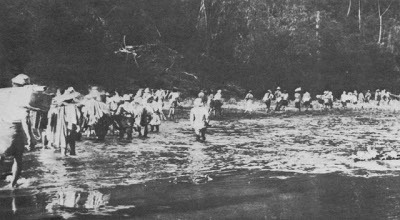 The Japanese, lacking such equipment, sometimes had engineers stand in stream beds supporting planks on their shoulders for assault troops to use for crossing.